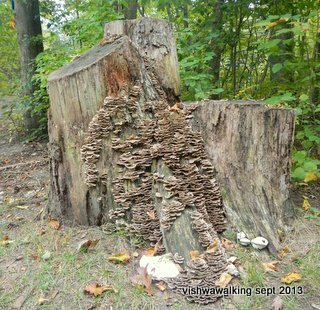 This conservation area has about nine kilometres of trails, all broken into sections or loops. At a couple of spots in the park, you can find a hard copy of a glossy map showing all the trails. There are seven trails here plus the The Rideau Trail which passes through the park, linking many of the trails. The longest is three kilometres, so you'll have to link two or three trails together to get a substantial walk. The shortest trail (0.1 kilometres) is really only an access to the lakeshore. 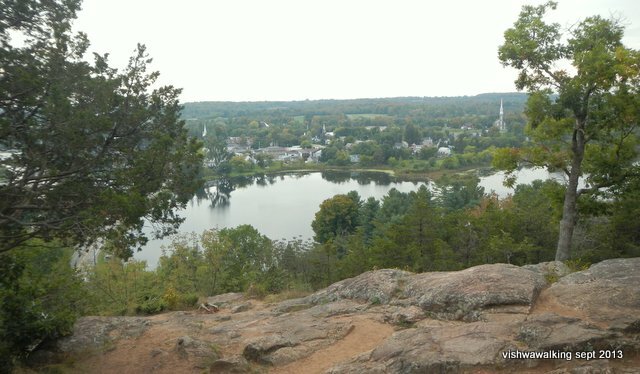 The park is perched on the mountain just to the north of Westport (this is the town's website), a beautiful historical and tourist town tucked between Westport Sand Lake (sometimes known as Westport Pond) and the much larger Upper Rideau Lake. If you decide to visit the park, it's worth scheduling a stroll around Westport as part of a day's walking. 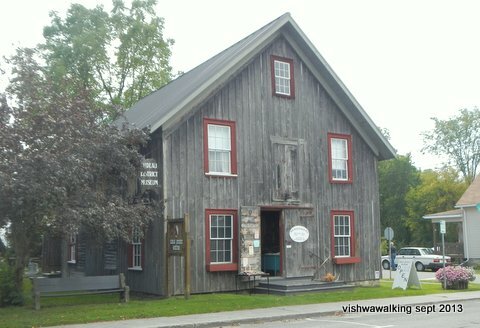 The Rideau District Museum is an excellent little museum at 29 Bedford Street in Westport. 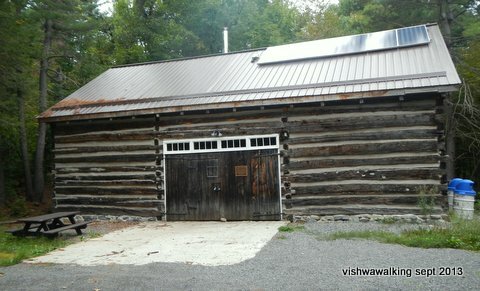 It is located in a building from the 1850s that once housed a blackmith and a coffin-maker's shop. In a back corner is a beautiful sad little coffin for a child. More happy displays include an exquisite Victorian-style doll house built in the 1980s and "Sally Grant," an 11-foot statue of justice (complete with balancing scales) that sat on the County Court House in Brockville until 1956. Now she sits at the back of the museum away from wind and weather. There's a donation jar near the entrance. After you've strolled through town, drive to Main Street which runs along the waterfront. 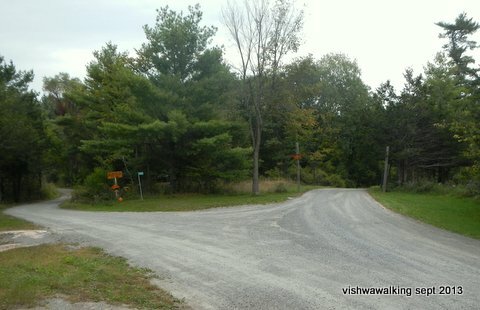 Turn left (north) and drive between the two lakes and up the mountain along County Road #10. About 900 metres from the bridge, Grady Road runs off to the right; the park road is immediately south at the same junction. You'll see the wooden sign for the park. It costs $6.00 per car to enter the park (or $45 per year). There's a machine just inside the park entrance that takes both coins and credit cards. The park is part of the Frontenac Arch Biosphere, a UNESCO-protected area. "The Frontenac Arch is the ancient granite bridge from the Canadian Shield to the Adirondack Mountains. Its incredibly rich natural environment and history was recognized in 2002 when it became a UNESCO World Biosphere Reserve, part of a world-wide network of 610 Biosphere Reserves in 117 countries." The quote is from the link just above; check that out for more detail. 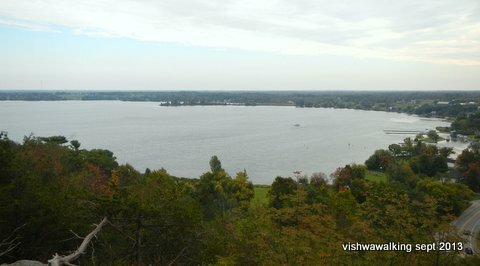 Spy Rock is a lookout, with spectacular views down to the town of Westport and the surrounding lakes. Even if you don't have time for a walk, this is a good place to visit. There are plenty of picnic tables sprinkled through the park if you want to use it for a lunch spot. For a description of how Spy Rock and surroundings came to be, here's a page. It refers to Foley Mountain as Westport Mountain and is hilariously overwritten, but bear with it and you'll get a picture of the geological history of the area. Left: The views from Spy Rock. 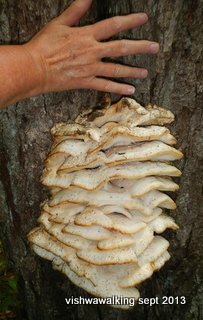 The top picture looks east to the huge Upper Rideau Lake. To the east (lower picture) is Westport Sand Lake in the foreground with Wolfe Lake in the distance. The spire of St Edmuund's Catholic Church can be seen in the lower picture. If you were to blow this picture up, you'd also see the Free Methodist Church further off to the right and the Westport water tower. The Spy Rock parking lot is just short of 600 metres from the entrance to the park. This trail heads off from the road, shares a short section with the Blue Circle Trail, then heads off to Beaver Pond, a little lake on the west side of the park. To make a loop, you must walk for a short stretch on the road. Blue Circle Trail 3 kilometres (from Spy Rock parking lot). 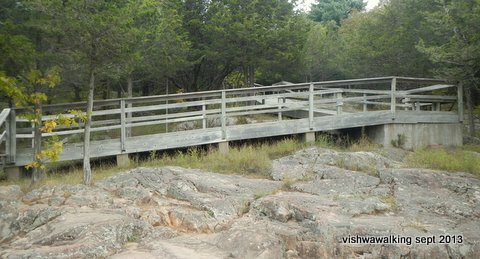 The best place to start this trail is at the Spy Rock lookout. It's clearly marked, with brochures, maps, an information board and outhouses nearby. The trail winds about until you come to a junction, roughly half a kilometre down the trail. Turn right (north) here, following the blue markers. Shortly after that you cross the park road near the entrance. The trail parallels Grady Road, which you will see through the trees to your left. The Beaver Trail also briefly joins the trail from the right, before it heads off right again to Beaver Pond. There's a flat marshy bit off to the left that the trail skirts before curving up a bit and heading eastward. As the trail drops southeasterly, you will see Beaver Pond off to the right, although the trail doesn't actually provide access to it. It then winds over granite rocks and through mixed hardwood and softwood forest. At roughly the 1.6 kilometre point, you'll see a log building through the trees. Again, there's no direct access to it; in fact there's a thin bit of rope running to the right (south) of the trail, perhaps indicating that bushwacking to the building is not advised. The building houses a museum of some sort, but was closed when I inspected it. It is accessible from the road. There's also a roofed-in picnic area and a camping area for groups nearby. The park brochures specify that it's for "youth" groups, so I'm guessing old geezer groups need not apply. At about the 2-kilometre point, the trail crosses the road. To the left, a sideroad runs off the main road to the (on-site) supervisor's residence. Not far from the road as the trail continues south, it joins the Red Oak Trail. Together, they travel southeast to rejoin the Rideau Trail. Near the trails juncture, if you parked in the Spy Rock parking lot, you may see your car. To complete the trail, stay on the path (resist taking a shortcut to your car). The trail becomes slightly confusing here, but just slow down and keep an eye out for trail markers. There are a couple of blue square (not circle) markers that might confuse; just ignore them. A road junction from the perspective of the trail. The trail crosses the road here. Back at the Spy Rock lookout stairway, you've done the loop. Retrace your steps back to your car and you'll have walked three kilometres. A short trail to the Upper Rideau Lake shore, behind the Interpretive Centre. This loop trail starts at the Interpretive Centre. The pathway is made of smooth very-fine-gravel to allow wheelchairs and other folks who might have trouble with uneven ground. It has interpretive stops to describe natural, geological and historical features. The lake is not far off through the trees and there are lots of benches. It's a good "leg-stretcher" if you can't do a longer walk. This is the westernmost loop trail in the park. From the map, it looks like linking it with the White Pine Trail would be a good idea, to give you a 4.6 kilometre trail. 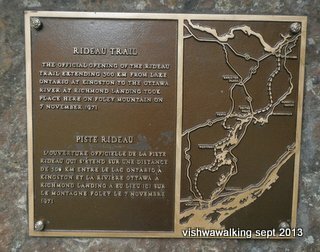 The bulk of this trail is shared with with either the Rideau Trail or the Blue Circle Trail, with a linking bit on its western edge. Mostly a linking trail between the Blue Circle, Red Oak and Orange Maple trails. Landing took place here on Foley Mountain on 7 November, 1971."